Alright, I thought it was only fair to provide at least a short1 introductory post before jumping right into the articles I’m interested in writing. My name is Colin, some of you have met me and many of you will have read a post or two by me under my forum name “bobliness”2, a smaller number of you have probably met or seen me at a tournament/convention. I’m generally the only Australian (Chunky excluded and no, despite there only being 8 people in Australia, he and I have never met) and I stand about 6’5”, am going bald and have a beard…..so I find it difficult to blend into a crowd. I played warhammer 40k primarily for the last 15 years or so (but who’s counting right?) along with varying smatters of other GW games (Bloodbowl in particular but mordheim and others) plus the obligatory D&D. I played Magic for a brief period in my youth and a slightly longer period online in my….later youth? Over the last two or three years I realized that within the 40k universe there wasn’t actually that much variation left that I could try with any degree of success against competent opponents. I played Eldar primarily and eventually settled on a list that I simply couldn’t really improve on outside of minor tweaks for differing tournament scoring systems. I figured at first that this was primarily an Eldar problem (Old codex and all that) but it wasn’t any better in my chaos space marines (who didn’t even have ONE competitive build, let alone several), taking unusual/quirky lists with either was an invitation to the opponent to just tear you apart. I started yet another army (blood angels) to play the less-played (competitively) of their lists (jump packs instead of vehicles) and realized almost immediately that once again there were very few actual variations in the list. You could change one type of jumper for another, or swap out a character or two, but it made little to no difference in play-style and tactical options. 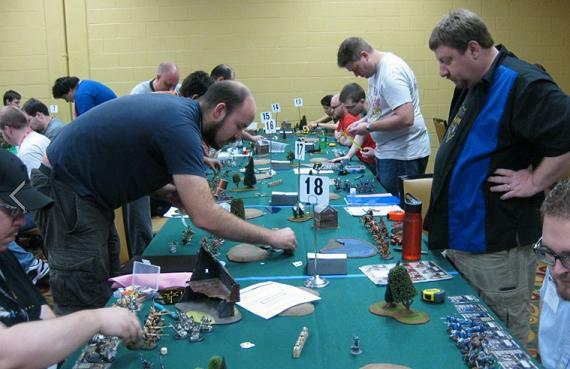 I had played the competitive scene in my hometown (Perth,Australia) as much as I could and had a lot of fun, but I felt like my success/failure was heavily determined by my army and the tournament scoring/scenarios, which were a patchwork, varying from objective heavy to kill-point/victory-point heavy, sometimes within the same tournament. I don’t necessarily have a problem with a variety of types of missions in a tournament, but ‘surprise’ missions don’t forge a competitive environment (merely an angry one generally) at the best of times and unfortunately, within 40k, there are a lot of armies that simply can’t compete in one or more types of scenario. When the TO goes “Hey guys, this time it’s elites are worth double kill points, their transports too! !” you can actually feel certain players die a little inside. In short3, I felt I’d gone about as far as I could with 40k and was feeling a little disillusioned with the game’s path forward. The future did indeed look fairly grim from where I was standing. So I wasn’t exactly burnt out, but I’d been looking around and noticing Warmachine/Hordes for a little while and considering whether I had it in me to change systems. At about the same time that Games Workshop released 6th Edition 40k. That seemed like an ideal time to try something new, so I took the plunge and my journey into Warmachine began. I’m now about 7-8 months in and I’m still of the opinion that this is actually both one of the strongest points of Warmachine/Hordes and also one of the bigger issues. I plan to write on this topic at some stage soon. The upshot of a couple of months of reading and thinking was me buying into circle. This may4 have been influenced by the opinions of the local store owner, Will Pagani5. Fast-forward through around 8 months of experience playing the game and I’ve been to a handful of tournaments. I’d consider myself to still be learning, though I wouldn’t feel comfortable entering a ‘young-blood’ tournament any more. With the background out of the way, my aim is to post a series of articles aimed at beginning players, to try to soften the impact of their first six months playing the game, but to also assist them in preparing for their early tournaments when it feels like everything you run into is a list you’ve never seen before. I may venture an article or two on the key components of learning the game, the things I’d recommend new players focus on to speed their improvement. From there I’d like to head into a series of articles around the game itself and the things peculiar to it (as opposed to other miniature wargames), which will also include the interaction with the “steamroller” rule-set which I think has really shaped competitive play in a massively positive manner. I’ll do my best to keep the text to a relative minimum, but I’m verbose by nature, so please bear with me. To those of you new to the game, welcome to what is, in my completely unbiased6 opinion, the best and most competitively balanced miniature wargame currently going around7. I hope your early months feature the occasional win and are enjoyable rather than discouraging. Rest assured that it does get easier and winning does eventually happen if you keep working at it! 10 – Alt text: Girl look at that posture (ahhh), girl look at that posture (ahhh), girl look at that posture….I work out.11. 11 – I don’t work out. Also, interesting fact, “gangnam style” is not an acceptable font style option. Pity.